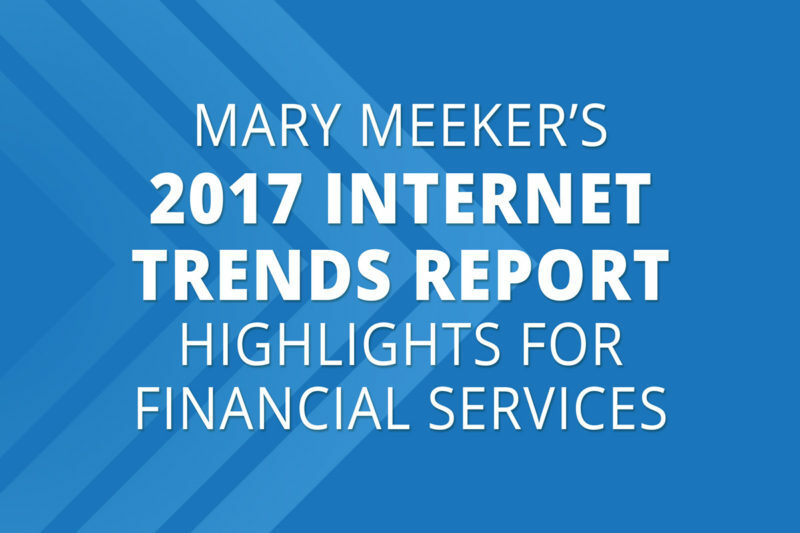 Each May, Mary Meeker of KPCB releases her annual Internet Trends Report highlighting trends across a variety of industry sectors. The report offers valuable insights for any business in which the internet plays a role in the delivery or marketing of a product/service. This year’s full presentation deck came in at a whopping 355 slides. If you don’t have the time to review the entire presentation, we’ve assembled some key highlights here that have implications for financial services businesses of all kinds. 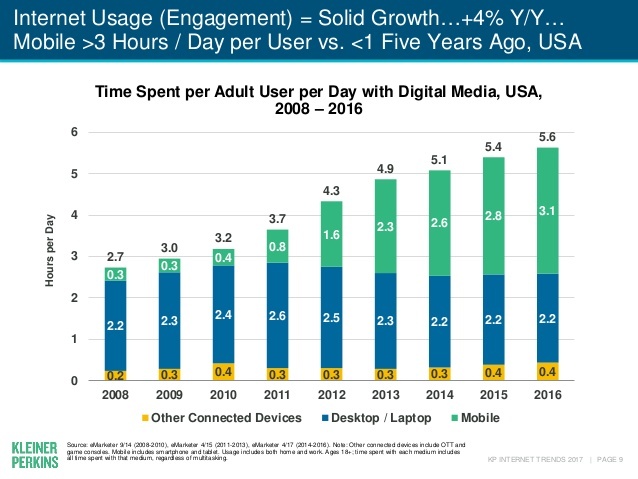 Slide #9 – Time spent on mobile devices using internet has grown from 0.3 hours/day in 2008 to 3.1 hours/day in 2016 – that’s almost 10-fold growth! Mobile internet use has eclipsed desktop/laptop use over the past several years and is driving overall growth in time spent online. The message is clear: as a financial firm, you need to assume that a client’s or new prospect’s ONLY experience with your website might be on their smart phone. It’s no longer an option not to have a responsive, mobile-friendly website. If the user experience is bad during a user’s commute to work, why would they bother to come back when they’re sitting at their desk? Your firm’s entire customer experience needs to be not only mobile friendly, but optimized for mobile devices. 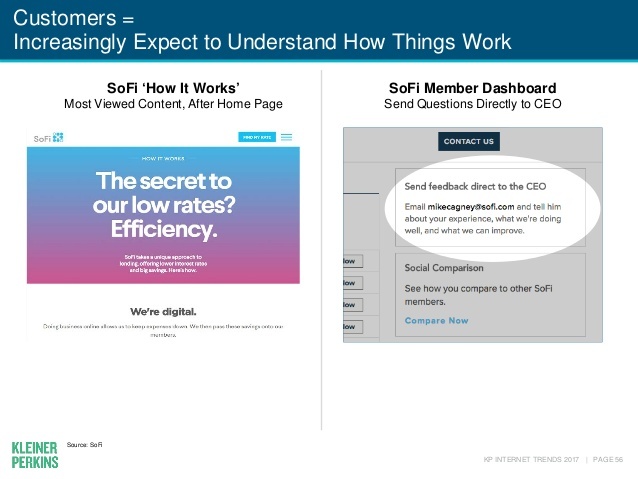 Slide #56 – Customers increasingly expect transparency, whether it’s understanding your business model and how it benefits them, or having access to leadership if things aren’t going well. 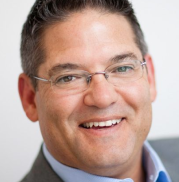 Social media will increasingly be used to drive accountability in the marketplace. Specifically, potential customers will visit a company’s LinkedIn page and expect to find complete profiles of key executives there. Websites like Glassdoor provide detailed information about the culture and ethics of an organization. 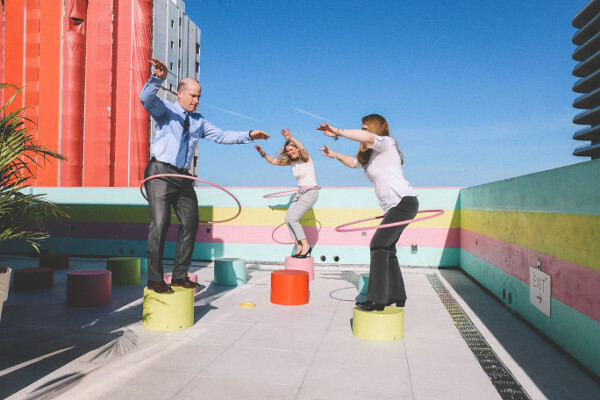 But that’s not to say that organizations are expected to be perfect – the key is authenticity. Customers will seek advice from peers about your company, and watch how you handle negative online reviews when they happen. Slide #90 – The report dedicates a considerable number of slides to the influential role that computer gaming has played in driving engagement and innovation in applications serving a wide variety of industries, including financial services. 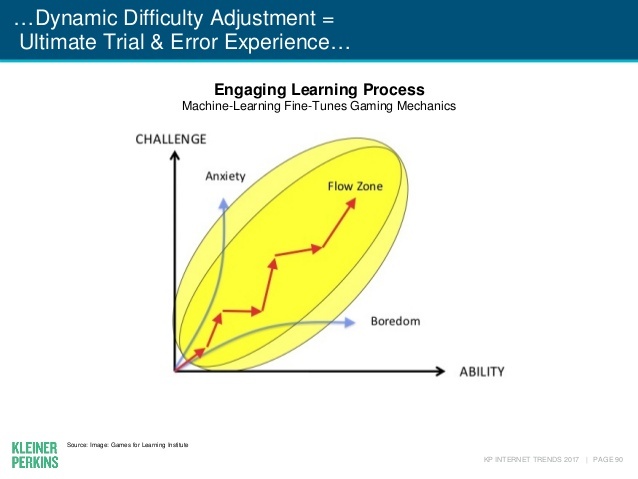 This slide nicely illustrates how game approaches dynamically seek to challenge users and drive progress. Truly addictive games provide enough challenge to be interesting, but not so difficult that users are discouraged. Similar approaches can and are being applied to driving sales performance and profitability in financial advisory businesses. 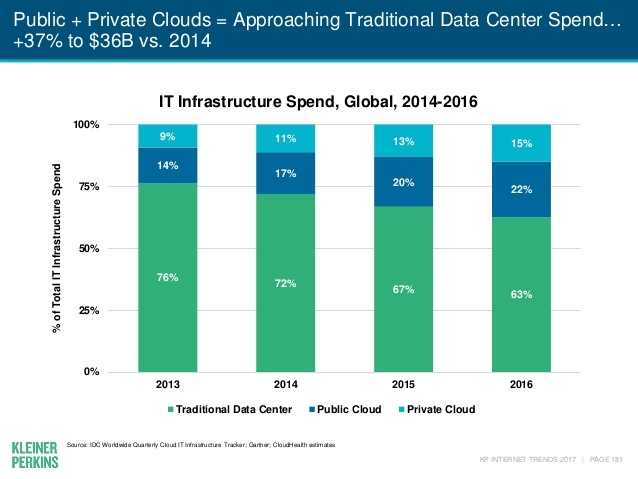 Slide #181 – Corporate IT spending on public and private cloud infrastructure has risen from 24% to 37% since 2013 and is approaching parity with traditional data center spending. 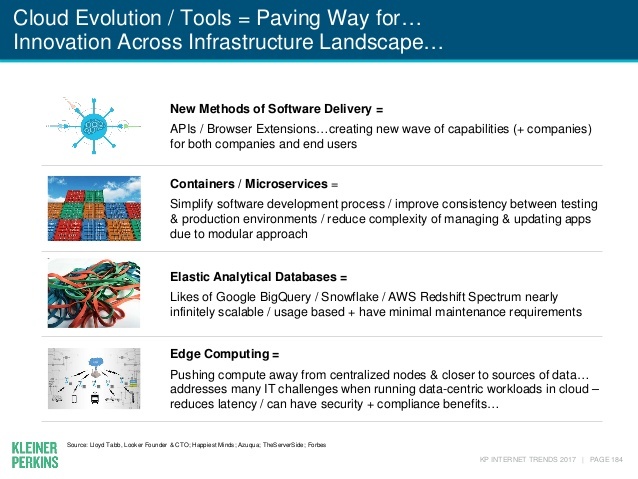 Slide #184 – The growing cloud hosting infrastructure is enabling a new generation of innovative application development, based on technology such as containerization, microservices, distributed ledgers and elastic data. Financial services businesses can leverage cloud-based tools and solutions to overcome legacy technology limitations and deliver resilient, scalable and secure solutions both for their customer-facing and enterprise needs. For more information on Xtiva’s new generation application, see XtivaCloud: Future-Proof Financial Technology. 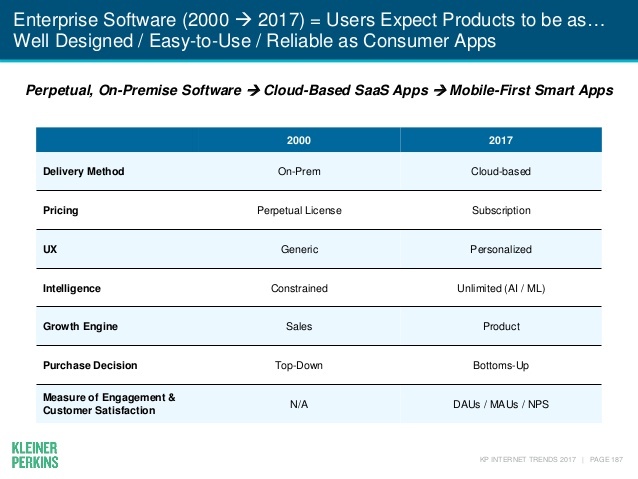 Slide #187 – Consumer user experiences have created a generation of users that expect enterprise software to be as well-designed, easy-to-use and reliable as consumer apps. User interfaces need to be personalized and intelligence is unlimited because external unstructured data can be leveraged. Slide #223 – The report dedicates considerable attention to Internet trends in China and India, but this slide caught our attention. 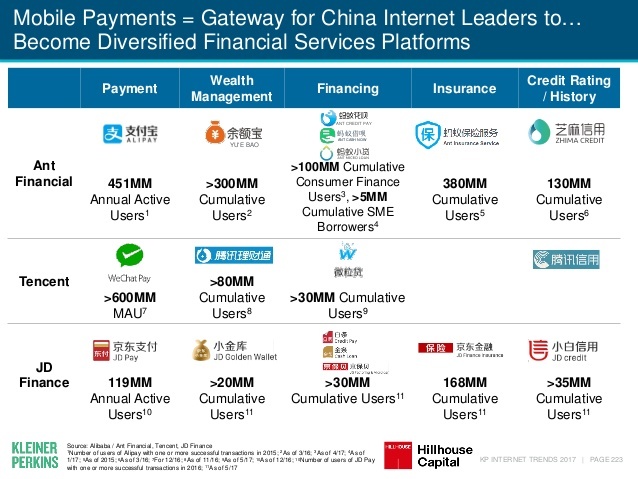 Mobile payment services have become a gateway for China’s leading internet companies to morph in diversified financial services platforms, including offering payments, wealth management, financing and insurance services. While this trend has progressed faster in China, watch for similar moves from internet service providers in North America. The message for incumbent financial services businesses is clear: think beyond the traditional competitors. To see the full presentation deck by Mary Meeker, visit http://www.kpcb.com/internet-trends.